The Pirna 014 was developed by the former Junkers-OKB Team, which returned to the German Democratic Republic between 1951 and 1954 under the Management of Rudolf Scheinost at VEB Entwicklungsbau Pirna, Factory 802. The design was already started in Russia as "Dwigatel 014". The engine was specially developed for the Baade 152 passenger Jet airliner. 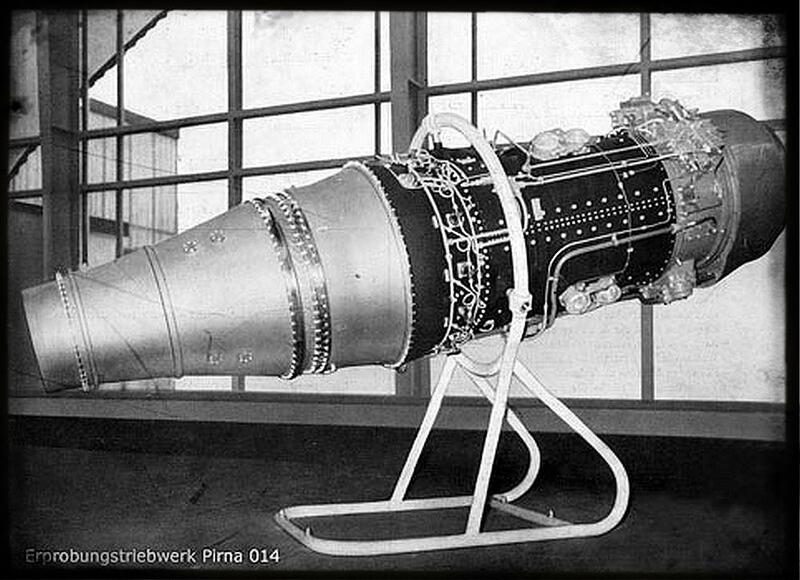 The Pirna 014 was a single-shaft, sinfle flow axial Turbojet developed on the design of the Jumo 012. The engine had an 12 stage compressor and a two stage turbine and a 12 chamber burner ring like the Jumo 012. A mockup and a first prototype were built between 1954 and October 1956. The first test cell run was performed on 12 Oct 1956. A further 13 engines were built for test cell and measurement runs. Type certification was achieved after a 150 hours endurance run in the second half of 1959. On 11 September 1959 the Pirna 014 was tested for the first time inflight with a Ilyushin IL-28R. The engine was mounted below the fuselage. A total of 23 Pirna 014-A0 preproduction engines were produced at Factory 802 in Dresden for the Baade 152 prototypes. Another 13 Pirna 014-A1 came also from Factory 802 for the prototypes. While the first Baade 152 had Russian engines, the Baade 152/II-V4 was the first 152, which was equipped with Pirna 014 engines in autumn 1960. The Serial production of the Pirna 014 was under preparation at VEB Industriewerke Ludwigsfelde, Factory 807. In May 1959 the first Pirna 014-0 (L1) was completed at Ludwigsfelde. Five preproduction engines L-1 to L-5 were already finished and a total of 19 Pirna 014A0 and 8 Pirna 014A1 were already under construction at Ludwigsfelde of which 17 -A0 and 6 -A1 were already finished. When the Aviation industry in the GDR was closed by Governmental Decision in 1961 a total of 36 prototype engines of the Pirna 014 were finished, plus five preproduction engines at Ludwigsfelde and 26 Serial engines were already under construction. A total of about 70 Pirna 014 were built between 1956 and 1961. When the aircraft engine production was stopped, the Pirna 014 was modified for other applications. The Pirna 014-A2 and -A3 were modified 014s for use as a naval gas Generator, while the Pirna 014-A5 was a gas Generator for turbine plants. Already in 1956 the ZTL Pirna 015 was discussed as a successor of the inefficient Pirna 014 engine, but the Soviets stopped the ZTL discussion and asked for an improved Pirna 014 TL engine. Initially the Pirna 015 was redesignated as Pirna 014E, which should enclose the Pirna 015 design in a Pirna 014 housing. Due to the excessive Need of Change of the Pirna 015 design, the Pirna 014E got a new Designator Pirna 016 in 1958.